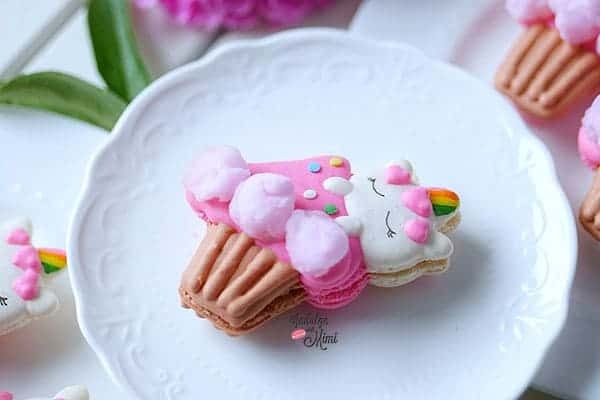 Unicorn macarons are definitely good but unicorns with rainbow horns hanging onto a cupcake topped with cotton candy are GREAT! 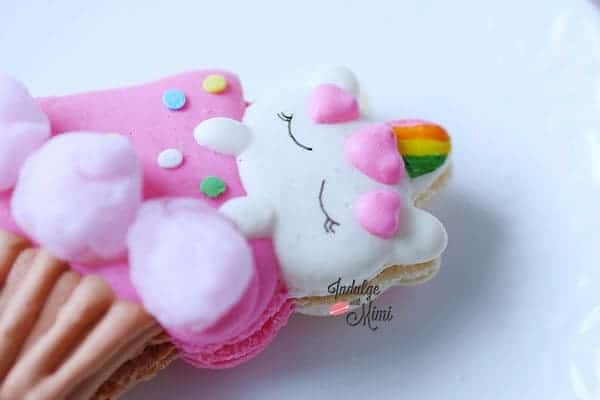 Ever since I created Tri-color Unicorn Macarons over the holidays, I’ve been thinking of new ways to incorporate this magical creature into my creations. 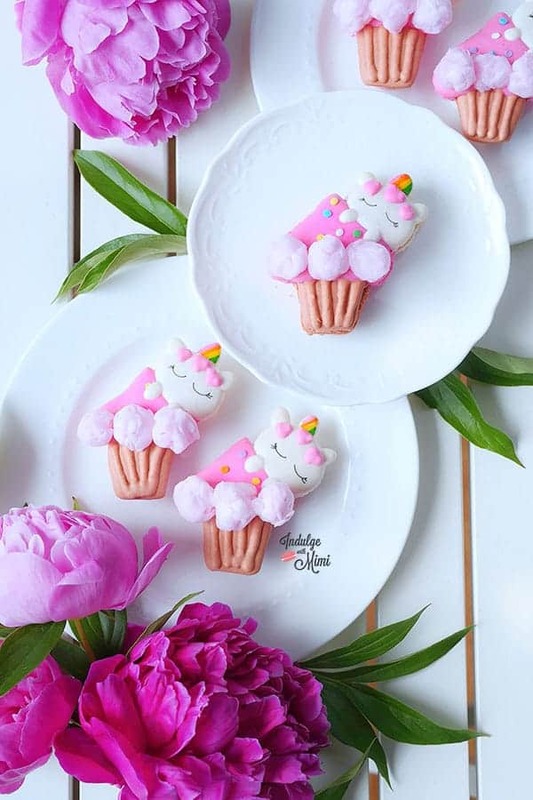 Another project I did was the Double Unicorn Macarons which was a collaboration with Christina’s Cupcakes |(see it here) . 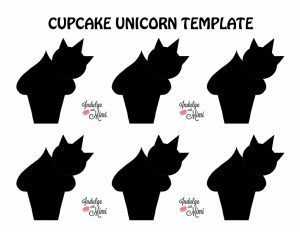 Today’s project is unicorns hanging onto one of the most photogenic treats out there – sweet pink cupcakes! 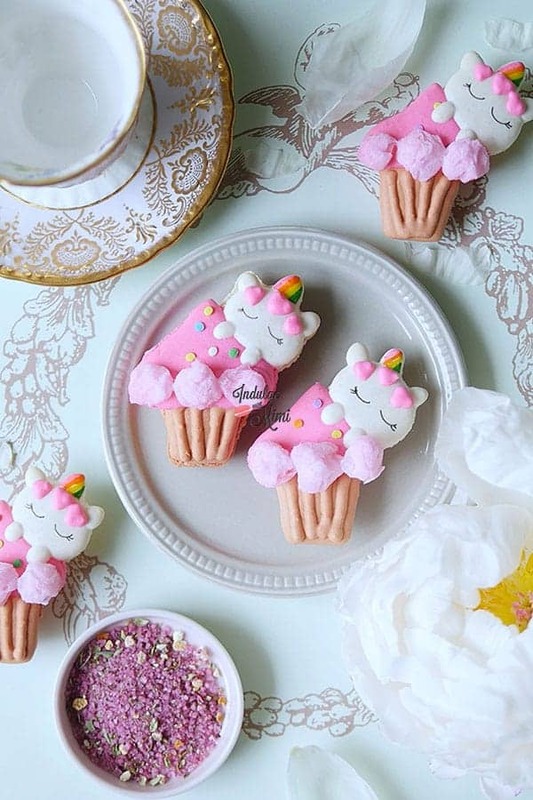 I think it has everything I ever wanted in Macaron Art. 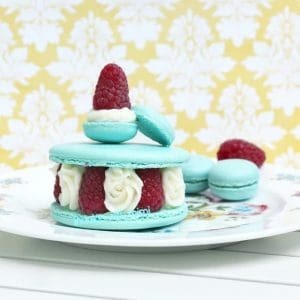 You’ll need to prepare three sets of batters using my Best French Macaron Recipe. 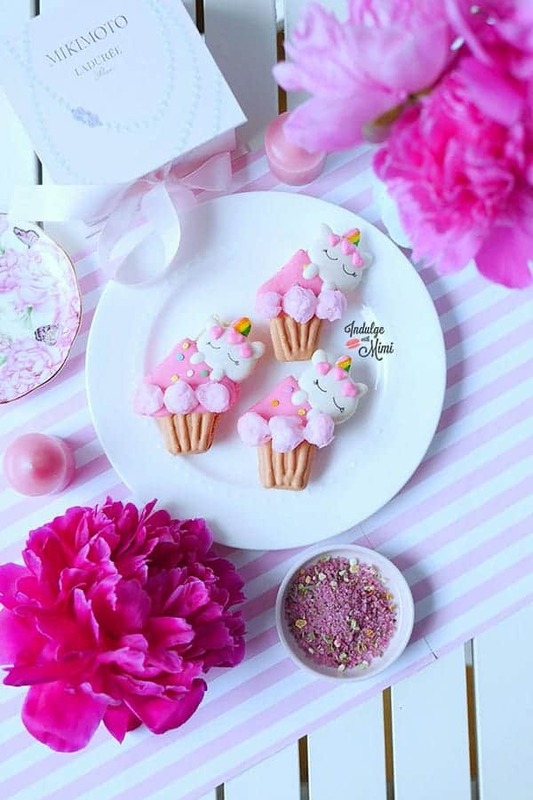 Pay attention to the ingredients for the pink batter, you’ll need a little bit more of it. For macaron art, I like to prepare different sets of batter separately instead of dividing them up into small amounts and folding in the color. I think there is too much room for mistakes that way. Over folding is a big concern since you’re adding colour to the finished meringue and not during the whipping process. I prefer to prepare different batters the longer and more reliable way. 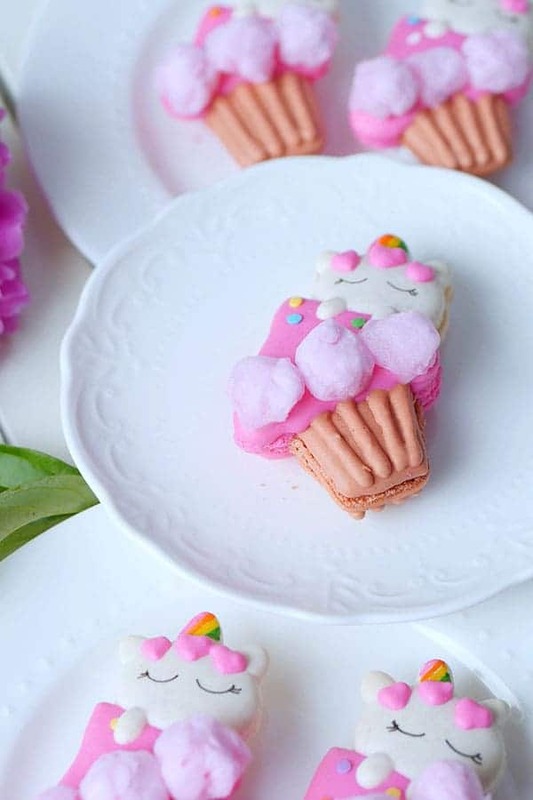 After all, it’s macaron art. It requires patience to realize the vision. 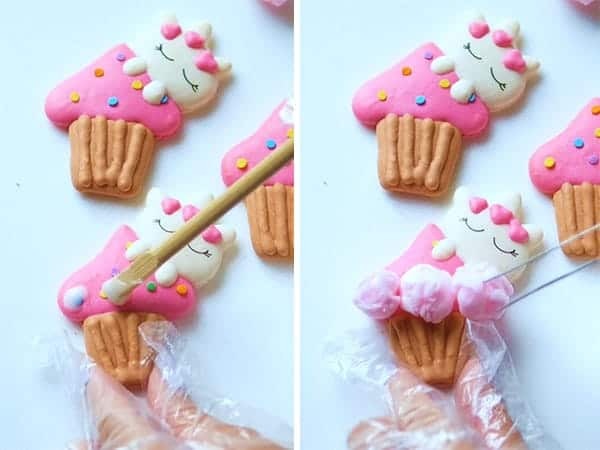 Plus, you will realize very quickly that there will be much more tears in the kitchen when you’ve spent lots of precious time piping your little works of art only to find that they don’t bake properly. I always have everything weighed out and ready to go. As soon as I have added the gel colour and finish whipping up a batch of meringue to stiff peaks, I will start folding it along with the almond flour. During this folding time, I already have another batch of meringue mixing in the Kitchenaid Mixer. It helps to work pretty quickly so the folded batter doesn’t have to wait too long and dry out. To further prevent this, I transfer the batter into the piping bag. And of course, it helps to have a stand mixer and several Kitchenaid bowls at your disposal. have everything weighed out and ready to be used. Whip egg whites and add cream of tartar and sugar at the appropriate stages. After adding gel colour to the meringue and it has reached stiff peaks, stop the Kitchenaid stand mixer, take out the bowl and start whipping another bowl of aged egg whites. Start folding the meringue with the almound flour. All the while, pay attention to the second batch of meringue that is currently being whipped. Continue to add cream of tartar and granulated sugar as per recipe instructions. 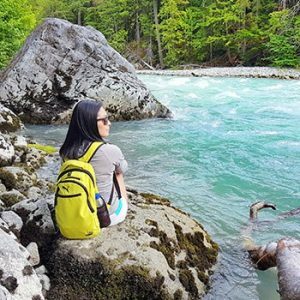 Go back to your folding whenever you can. 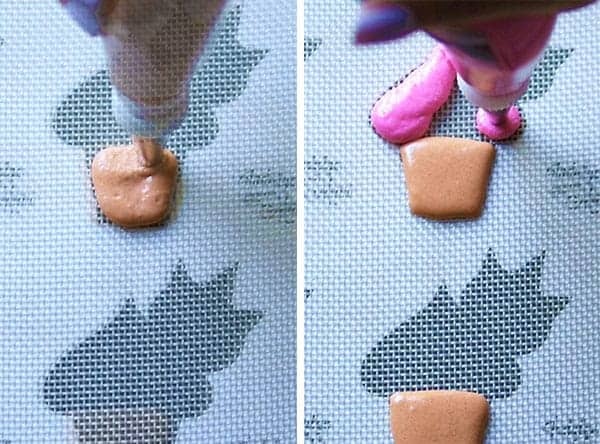 Once you’ve folded to the honey or lava stage, transfer the batter into a piping bag to prevent it from drying out. The second batch of meringue should be ready to be used now. Continue steps 2 to 5 until you’ve created all the colors you need. The cotton candy is optional. I added it because I had it on hand from my afternoon experience at Trump Hotels and thought it was a great opportunity to experiment with it. It’s so fluffy and make the design really Pop! However, please note it needs to be added on immediately before consumption since they deflate within half an hour. I’ve included a video to show you the steps in piping this character. Pipe each part according to the steps shown since you’ll need to wait until certain parts dry up before adding more batter to it. 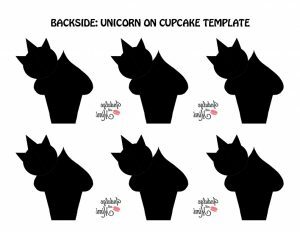 As for the template, make sure you print out BOTH of the unicorn cupcake templates. It’s an assymetrical design so that’s the way to make both the top and bottom shell match when they’re assembled. 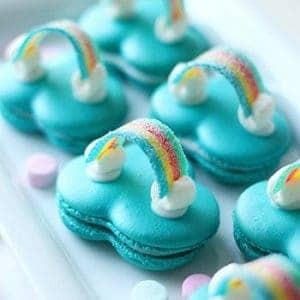 This situation actually arose with one of the readers who used my Over the Rainbow Macarons, the clouds weren’t matching up after baking because they had missed reading the instructions to print out BOTH templates. Lastly, I’m going to be drawing a winner in four days for my latest Giveaway. There’s still time to enter. Get the instructions here. Good luck! 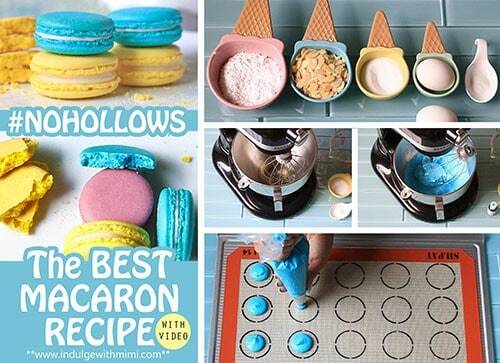 Follow my Best Macaron Recipe for instructions on how to make the macaron shells. 3.) 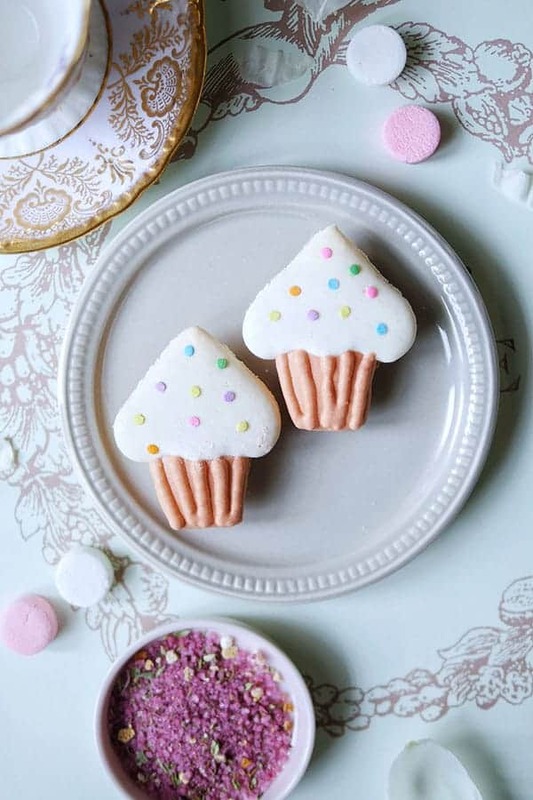 Before the pink batter dries up, gently add the confetti sprinkles on top with tweezers. 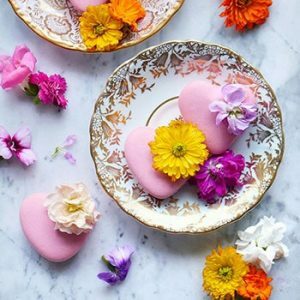 Do this for each macaron before moving onto the next step. 4.) Pipe the ridges on the cupcake base with a fine tip, Wilton 4 is used here. 5.) Pipe the unicorn head with a medium tip, Wilton 10 is used here. Do all the heads at once. 6.) 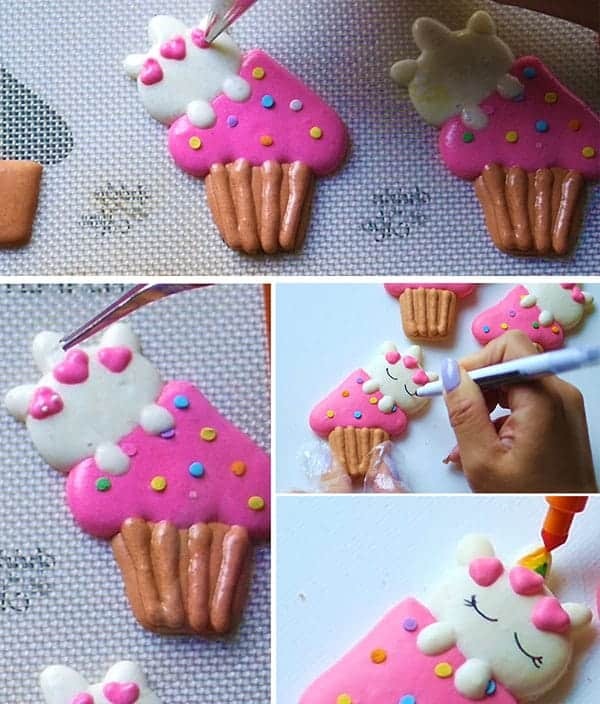 Pipe the unicorn horn and ears with a fine tip, Wilton 4 is used here 7.) Once the pink top has developed a “skin”, add two little feet with a fine tip. 8.) Once the heads have developed a skin, use a fine tip to add three hearts onto the unicorn head. 9.) 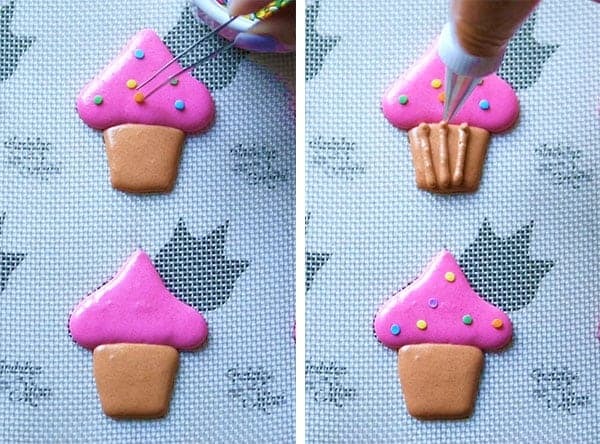 Add white sprinkles onto the hearts with a tweezer 10.) 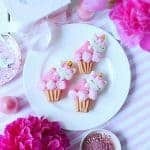 Bake the macarons according to the instructions in my Best Macaron Recipe 11.) 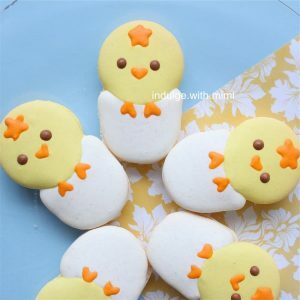 Once the macarons have finished baking and have cooled off, use a fine tip edible pen to draw in the eyes and eyelashes 12.) 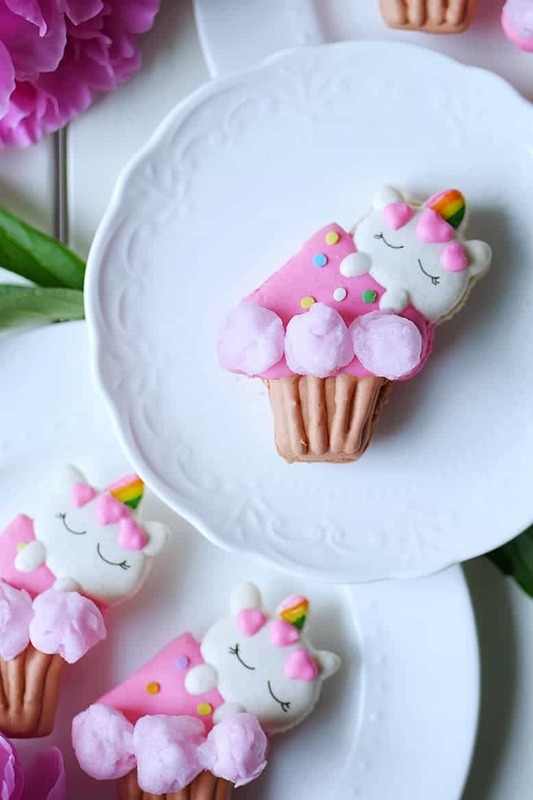 Use edible pens to color a rainbow pattern on the horn. Optional: Roll up cotton candy into a small ball. 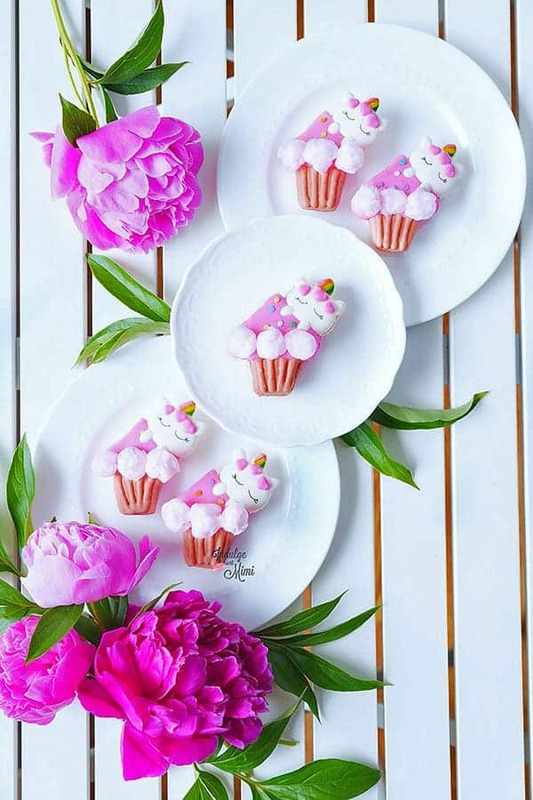 Use edible glue to glue the balls onto the edge of the pink cupcake topper. COTTON CANDY MUST BE ADDED IMMEDIATELY BEFORE CONSUMPTION. 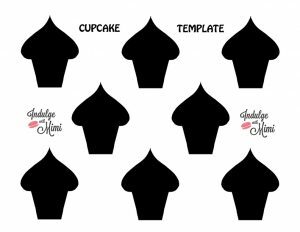 Sign up for the newsletter, wait for the confirmation email, confirm your subscription and you will be sent the password to exclusive templates for subscribers only. Most recipes show tapping the tray on the counter after piping, before letting them set. When there are multiple parts/layers piped, at what point do you tap out the bubbles? I will tap it for the main parts. To be honest, if your batter is good, it will usually bake fine without any tapping. Tapping it just gets some of the bubbles out and you can do that by popping it with a toothpick. If your batter has too many bubbles, that’s an inherent problem in the batter. I signed up for your your newsletter around three hours ago and i haven’t gotten the password yet. Making sure you got the correct email address. thanks.